As a model made expressly for smaller APS-C size sensors, and equivalent to a 24mm wide-angle in 35mm terms, the new manual focus Samyang 16mm f2.0 is a unique proposition. This particular model has a Canon EF mount, but along with the inevitable Nikon F DX and Sony A mount options, it’s also available with mounts for mirrorless cameras including Canon EF-M, Sony E (NEX) and Fuji X, Samsung NX and Micro Four Thirds. Like the firm’s other lenses with a Canon EF mount, this model has no electronic contacts, meaning it has no automatic diaphragm and lacks both compatibility with certain exposure modes (Tv, P, flash and certain scene-based modes) on Canon DSLRs. There’s no EXIF data recorded either, meaning it’s impossible to determine what apertures were used when adopting lens correction profiles (not knowing what aperture was used for a shot is also, arguably, a little disappointing when browsing at a later date). Exposure metering is also limited to stopped-down metering only (though that’s not much of an issue with Canon DSLRs). Together the lack of these features is somewhat restricting in a modern lens like this, but at $399 this model remains tempting. It has a thirteen-element design with one ED glass element and 2 aspherical (one being a hybrid type) to reduce aberrations, while focusing to a closer than usual 7.87” (20cm). As a high-speed lens, the 16mm f2 has a large 77mm filter thread, measures 3.39 x 3.52″ (86 x 89.4mm) and weighs a hefty 1.28 lb (583g). 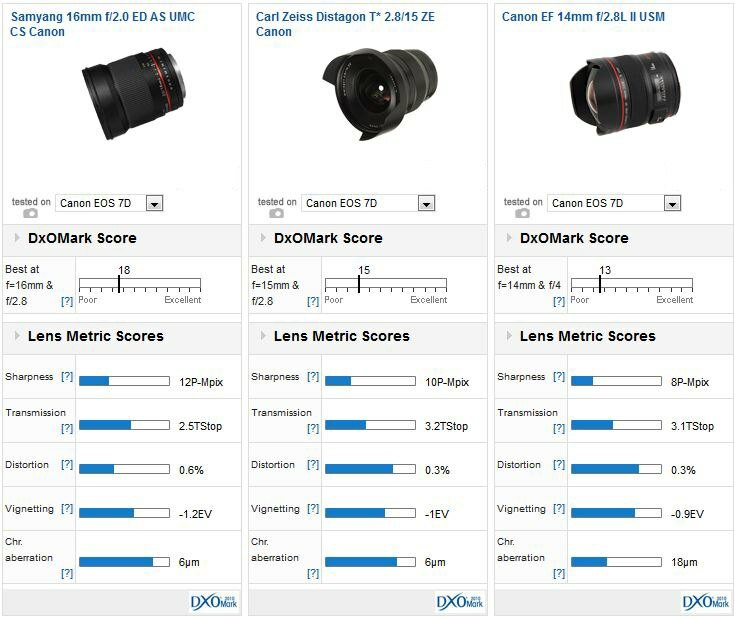 At this focal length, choices of primes are restricted for APS-C users, but of those tested the Samyang achieves the highest DxOMark score and has the highest peak sharpness. Even the world-class Zeiss Distagon T* 2,8/15 ZE can’t quite match the smaller and faster Samyang. 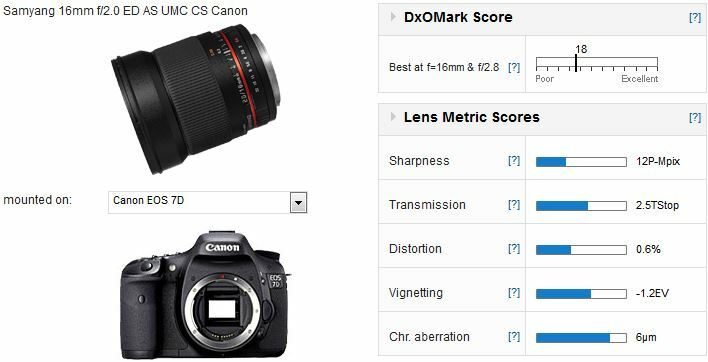 However, it’s worth noting that the other models in this list are full-frame (albeit tested on the APS-C Canon EOS 7D). Designing a lens with a smaller imaging circle, like this one, is likely to result in higher image quality but that’s not always the case. All things considered, the Samyang has very high IQ and excellent sharpness. A DxOMark lens score of 18 points is excellent on a lens like this and while sharpness is dependent on the lens and sensor together a 12P-Mpix score is excellent. Full-aperture performance isn’t bad but like so many high-speed design it requires stopping down at least one, ideally two stops for the performance to improve noticeably. Optimum performance is achieved between f4-to-f5.6. Transmission is a little lower than expected on the Canon, but distortion vignetting and are all well controlled, particularly the latter, which often causes problems with designs like this one. Full aperture performance isn’t great on the Canon EOS 7D, but the uniformity is promising for higher resolution bodies. Stop down one stop and sharpness improves noticeably. 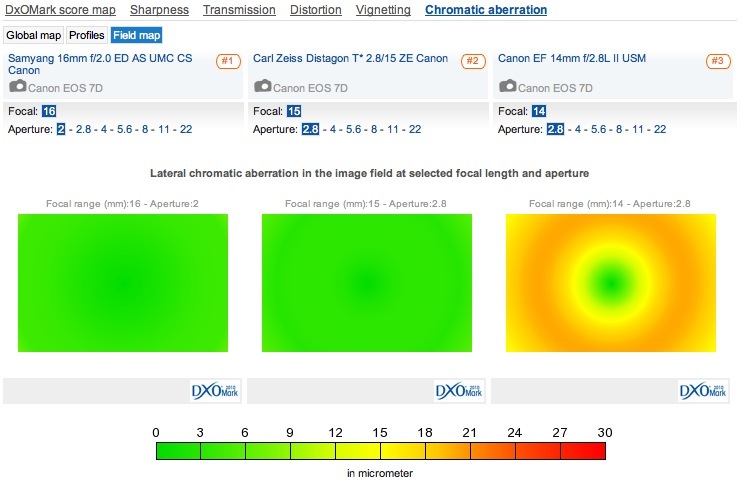 Both the Zeiss and Canon lenses are slightly shorter in focal length and makes a big difference with regard to the field of view, however that’s less apparent on a cropped sensor like that found on the Canon EOS 7D. In its defense the Samyang is a high-speed model and yet it still has higher peak sharpness. It doesn’t match the center sharpness of either the Zeiss or the Canon at the initial aperture but it does have noticeably better uniformity across the field. At 2.8 and onwards, the Samyang’s superior uniformity makes it much more attractive than the other two models, although they can boast lower distortion and vignetting. It’s also worth noting the Canon has very high levels of lateral chromatic aberration, which requires dealing with, either in post-production or enabling in-camera correction of Jpegs. The Samyang, like the Zeiss has excellent control of lateral chromatic aberration; the Canon, not so much. At first blush the Samyang 16mm f2.0 may seem like an oddity but as the equivalent to a 24mm on APS-C bodies, it makes perfect sense. 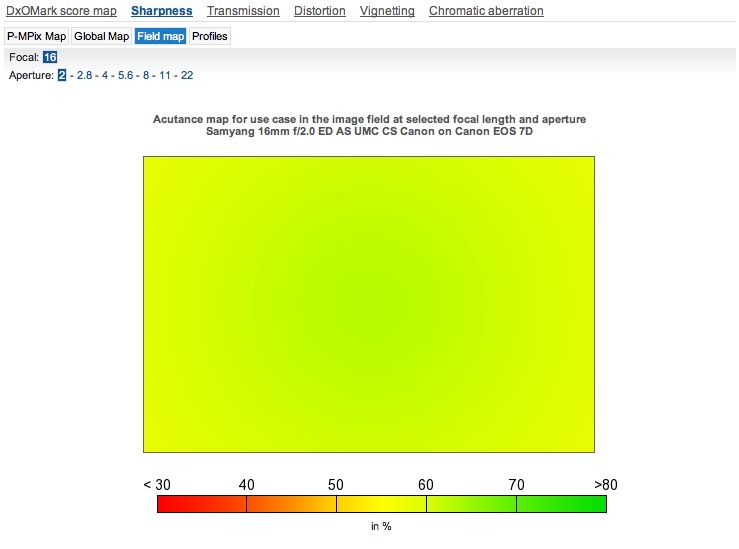 Better still, image quality is very good and sharpness is high on APS-C bodies. However, there are some shortcomings beyond the lack of AF. The Canon mount version eschews essential features including an auto diaphragm (which is found even on the most affordable lenses today) and it lacks compatibility with certain exposure modes. 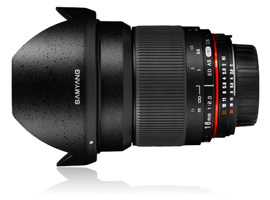 However, given the rock-bottom price and great image quality, the Samyang is a highly attractive option.